1. How should I shape the rotor blades? The rotors push the air while the stators stop the air from spinning, and I have designed the stators accordingly. The rotors will have a regular fan shape and so I'm wondering if I should have the rotors increase their blade pitch as the air flows towards the exhaust, this way incrementally increasing the speed of the air, or if I should start out with high pitch rotors and keep them all at the same pitch and since there are a lot of rotor stator stages, the pressure difference created will be enough to create a decent airflow. 2. Is the long nacelle and multiple stages worth it for the increased airflow or is it just too inefficient to justify the effort and I should just stick with a little, at most 2 stage ducted fan and it will be better, even with the same motor? My goal here is to make a small turbojet like thruster which may end up on a small, 30-40cm wingspan plane. Due to the high pressure difference that I think this design can create, I'm thinking about also adding a nozzle to increase the speed of the air, but I'm not sure how much will all this stress the motor. The nacelle should be about 134% of fan at intake and between 85-95% at exhaust. That's what has been explained to me and it seems to have always worked quite well. I think the rotors should start with high pitch. I am not aware of multiple stages of rotors and I think you'll find that just one at the correct pitch with the tapered nacelle will get you the best performance even with the moveable nozzle which sounds like thrust vectoring.the multi stage is a NEW concept to me so I don't even know where to start. I personally think the extra weight and extra work wouldn't improve performance. I'm not an expert, just letting you know what I've been told. Let us know what happens cause the multi stage is intriguing to me. May your flights be long and your landings always soft! Firstly in a true jet engine compressor each successive stage has a reduced input area and the blade incidence reduces to give maximum compression of the slow moving air. For your exercise you are trying to accelerate the air and not really compress it for combustion. You could use the same fan blade profile throughout the device but each successive blade set should turn at a higher rate. If possible consider a tapering tube to reduce the airspeed internally so the blades can work more efficiently and with greater loading. The use of an alternate balde set direction through the unit could reduce the need for the stators. Internal turbulence caused by the blade to motor to blade transitions are going to rob you of more efficiency and thrust than you could ever hope to regain with the use of stators. If you can fit the motors in a tube ad provide a seperate airflow for cooling you may actually gain something! The tapering tube is similar to what I was thinking about the nozzle, but I'd make it at most 5cm long and maybe add in some parallel blades to laminarize the flow of air. About the counter rotating rotors, yes I agree it is a good design but I don't have the means to make such a thing, same with increasingly faster spinning rotors. The only thing that I can make and is similar to the latter is having increasingly higher pitch rotors to accelerate the air gradually, opposite to a turbojet compressor, but I'm not sure how good or bad of an effect it has on the pressure, and I'm not even sure it matters that much. After I've designed the internals properly I will worry about motor placement and I will also add a wider, rounded inlet for the thruster. What I am nearly sure about is that the motor will not sit inside the tube. I will send some pictures later which will probably clarify some aspects. A rough CAD design of how the internals should look like. 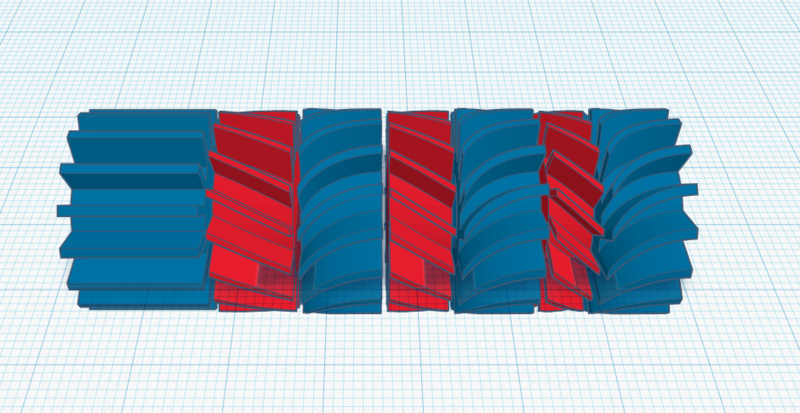 Blue are stators, red are rotors. The inlet is on the right, air flows towards the left. The rotors spin counter-clockwise. Bearings will be in the leftmost and rightmost stator only. This design isn't final since I still have many questions about whether anything of what I am doing is right or not. Here is what I made so far for dimensions testing. The rightmost element is a rotor, the rest are stators with a bearing inside of each. I made the rotor similar to the stators because I just wanted to see how well everything fits. Everything is fixed along the threaded rod with nuts. The nacelle is held in place simply by the friction of the stators against the walls, and it holds surprisingly well. The bearings are just regular ball bearings, nothing fancy about them. The nacelle has 7g and the axle has 24g with the currently mounted elements. Is there anything wrong with any of this? Could the final setup be efficient enough to, atleast just barely, justify the efforts? I've never made a propulsion system such as this before and that is why I'm asking for help. Hahah, thanks. Tho it is still technically an EDF, I guess, right? Or rather, lots-of-electric-ducted-fans-in-a-single-duct. It's a cool idea but I think not only the weight of the assembly but rotating mass to get up to a good speed to produce the thrust you will want it will take a pretty large motor. I agree, although I don't it is a problem if it takes a bit longer to spool up as long as it makes decent thrust. I love the detailed work and it seems to be almost based upon an axial water jet or a water wheel but you may find that the closely coupled nature of the blades and stators as well as their blade area and surface irregularities could really provide such levels of drag and turbulence that the thrust output will be far less than you are hoping for! The stators could have their pitch and blade count severely reduced as you need only to reduce the airflow spiral without adding too much drag. In order to increase the thrust output you need to accelerate the air through the device. Any inter stage drag is going to reduce that acceleration and the thrust output. Using successive sets of blades with the same pitch will do little increase the speed of air beyond the acceleration provided by the first set. Sure the successive sets of blades will accelerate the air they encounter but this is only after it is slowed down by the stators first. The resultant airflow will not be increased much beyond the increase imparted by the initial set of blades. The stators as shown could actually cause a high pressure area at their Leading edge area in the gap between the trailing edge of the compressing blades and the stator. if formed this high pressure area, (formed by turbulence), could actually increase motor load and reduce thrust output or airflow through the entire device. Finally all of the air that flows through the device must pass through the first set of blades. As these blades are the same pitch as successive series of blades the improvement in airflow speed caused by successive sets of blades will be minimal at best. Sadly as in real axial compressors including those found in turbo jets multi stage compressors do not work well without different blade geometries in the successive compressor stages. If others who have experience could advise it would be appreciated! Thanks for the info. I will adjust tomorrow. Also I'm not sure you noticed that the rotors actually have different pitch. Also, using ABS to print the pieces means that I can use acetone to smooth out the surface very well. Wow! I applaud your tenacity and drive, and admire your ability to actually print clean looking fan blades! Several people over the years have attempted to get more power (thrust) out of multiple inline-ducted-fans, myself included. Alas, we have all found that the end result is always less powerful and efficient than either 1) Putting more blades on the fan rotor (more low-speed thrust), 2) Turning the rotor faster with a more powerful motor (more high-end speed). Or, forgoing either of those options: putting two fans side-by-side. In my personal experiment, I tried putting two identical fan rotors in a common duct, driven by two individual motors with different Kv-values. The second motor would turn at a higher RPM than the first, theoretically to accelerate the air further and produce more thrust. The resultant thrust of two-EDFs-inline, actually measured, was only marginally better than a single EDF, and much less than two EDFs side-by-side. Unfortunately, the realities of the flow-regime in which we operate at the scale-RC level don't lend themselves nicely to this kind of powerplant. An electric ducted fan is a very low-pressure propulsion system, which relies entirely on simply accelerating a mass of air in a certain direction to produce thrust. Multistage compressor, as in a turbojet or turbofan, has a different specific function; that of compressing the air in order to facilitate combustion with added fuel. It is this combustion that is the primary source of thrust in a turbojet, not simply the moving-mass of air. Actually compressing air takes a lot more power than most of our hobby motors are sized for, let alone the issues of injecting and burning fuel and turning a high-temp turbine after that. Please don't take this as a discouragement; I only wish to share what I've done, learned and what others have as well, so you can learn from our experiences and hopefully improve with yours. Your setup IS slightly different, in that you actually have a common shaft and more closely-coupled interstage stators. Mine had stators, but they were straight and not so close to the rotors. Think about this too: Even full-scale turboFANS only have one "FAN" section in them, and that is where they get most of their thrust. In a turboJET, there is a multistage compressor, combustion chamber, expansion and a turbine. The turbine uses some of the energy from the hot gases to drive the compressor which keeps the engine running, but the thrust comes from expelling hot expanding gases at high velocity out the back. In a turboFAN (and turboPROP), there is a "core" which is essentially a turbojet, who's sole purpose is to drive a secondary (or tertiary) turbine which itself drives the FAN (which is ducted) or PROP. In both turbofan and turboprop, the large majority of total-engine-thrust comes from the FAN or PROP, NOT the 'turbojet' core. So, when you think about it, even the big guys don't make multistage ducted fans. As for this experiment; even if it never makes its way onto an RC plane, you might learn something valuable from the process, so don't stop! Hook up the drive shaft to an external motor and measure thrust, RPM, temperature (if you can), you might uncover something you weren't looking for. The fact that you had the drive, ingenuity and thought processes to arrive at the question of "how do I make air go faster? ", means that you have a great experimental brain capable of innovation. Don't ever stop that. I agree with @Mid7night and @Hai-Lee on all accounts. Especially the point of continuing your experiments. I will also add, in theory having more than one motor and fan inside a single housing should create less of a load on each motor. In a perfect world it should cut the load in half, but in practice it will be a bit less. This in theory would allow you to up your kv or voltage to create more thrust at the same wattage per motor. I have been toying with this idea for a while just to get somewhat respectable thrust numbers out of a small diameter EDF to create something small and true to scale. Unfortunately I have not had the time. Keep up the experimentation and keep us posted on what you find. Thanks a lot for that. I'll try my best to get it to work. I have no experience with RC planes (just cars, helis and drones) besides reading, watching videos and simulators, but I think this experiment gives me a good exercise on a lot of other things too, besides the opportunity to get into RC planes. But clearly I can't do it all by myself. Now, even if it ends up having just slightly more thrust than a single rotor device, I'm still very stubborn to make it work on a plane simply because I subjectively prefer it over a single rotor. And if it has less thrust, I'll make it have more. A question: what gain in efficiency there is, if any, by making the rotor blades have higher pitch the closer they are to the hub as in, say, a computer fan? I think if you could rig it up so you could mount it onto a thrust stand along with a wattmeter you could test all your combinations. All the info would be right there for you to answer all your own questions . Actually, I first started with the idea of making a steam turbine with this. I had a larger mark 1 in the past which barely worked because of many reasons. 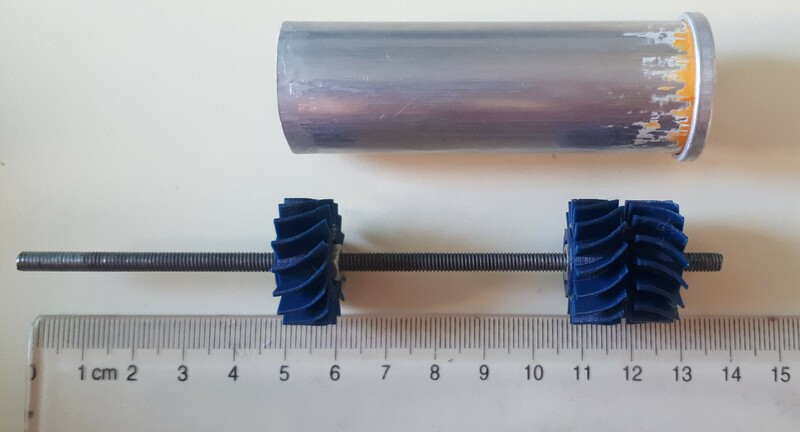 But while working on this new, tiny turbine, I thought that with the aluminium tube I could make a multistage EDF instead, and so I postponed the steam turbine until I would get a working thruster. You talk about a 30-40cm wing, and then your design. What would be the dimensions and weight of your unit? That would tell you if it would be possible. Well, the tube is 7g and the axle with the 3 elements I have on them right now are about 24g. I think the total, final setup will be roughly 60g, without the motor. The tube is 25mm interior diam., 80mm + 40mm nozzle length, hub is 15mm diam. but I will reduce that when/if I get smaller bearings. Current design, stators are 9mm tall, rotors vary several mm around that, depending on the pitch. The rotor/stator elements may vary as time goes on since I'm still working on them. As I said I have no experience with RC planes since I have never interacted with one, except visually (watched a bunch of RC hobbyists pilot their combustion engine planes when I was little). 30-40cm is a wild guess based on the size of the tube alone. I can make good paper planes though, if that counts. Ok, I improved the virtual design a bit. Again, red - rotors and blue - stators. Halved the stator blade count to 8 and sharpened them to reduce drag. Made the rotor blades have higher pitch closer to the hub. The green part is the outlet nozzle which has 8 parallel blades inside for straightening the airflow. The nozzle design isn't final, that is the base design so far. The end design of it will fit over the tube and I'll probably fix it in place by glue or something. I'm not sure how good that sharp tip of the stators is compared to a rounded tip since I'm really unsure at which angle will the air strike the stators. Also, I think I should only have 4 nozzle fins instead of 8. Rotors and stators have 2mm between them but in the physical design this may vary between 1.5mm and 2mm due to the thickness of the nuts. I can add in some spacers if needed. Rotors are 7.5mm thick and 24mm diam., stators are 9mm thick and 24.5mm diam.. I settled on a 30mm long nozzle, but I can make it longer to reduce drag a bit. All those thin walls like the blades or the nozzle wall are 1mm thick which is sturdy enough, especially at those small sizes.